Hundreds of schoolchildren across Shropshire and Staffordshire learned new music and dance skills through our educational outreach programme under the Room for All umbrella. Professional dancers delivered workshops at four Shropshire schools – Chirbury Primary, Gobowen Primary and St George’s Junior and Radbrook Primary in Shrewsbury – from January to March. Children created performances blending Kathak, an expressive form of Indian movement, with contemporary dance. Dance instructors were Kathak expert Sonia Sabri, Contemporary Dance Artist Rachel Leggit and Dance Artist Poppy Mansfield. We organised two special workshops aimed at spreading the message about traditional English dance to a new generation of children. 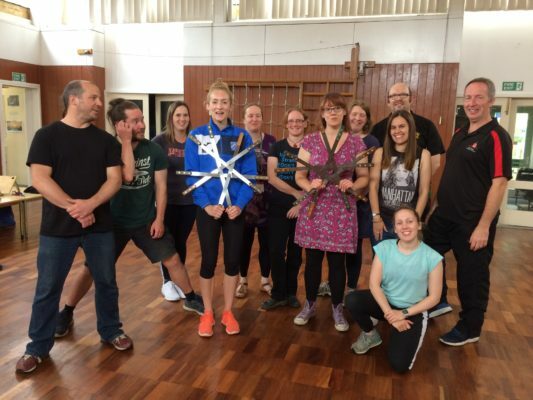 Breaking Tradition delivered a day-long workshop to give Shropshire primary teachers an insight into how to combine folk dance with contemporary hip hop and how it can be incorporated in the timetable for lessons in dance, fitness or culture. We also ran two free Continuing Professional Development (CPD) sessions for teachers and produced an online teaching resource to support staff to teach dance as part of the National Curriculum. Breaking Tradition also led a session for the junior rapper dance teams based at Trinity School in Ford, near Shrewsbury, to learn new figures, dance tunes, and clogging. The teams were formed during our previous All Together Now project. Head Teacher of Trinity Primary School John Rowe: “Our children, many of whom had no experience of folk music or dance, have adored learning rapper dance. In Staffordshire and Telford, we joined forces with In Harmony Telford & Stoke to fund visits to schools by three musicians – folk artist Joe Broughton, Bollywood and Banghra specialist Sohan Kailey and African drummer Calvert Lawson – who delivered creative music workshops for instrumentalists. They worked at Thistley Hough Academy in Stoke-on-Trent in January where the In Harmony programme teaches all year 7 and 8 students to learn a musical instrument; and in Telford where In Harmony works with more than 600 children from early years through to Year 10 and is based at Old Park Primary School in Malinslee, Telford. The artists also carried out further visits with a smaller group of more experienced young musicians to help them develop their skills and explore different musical traditions. 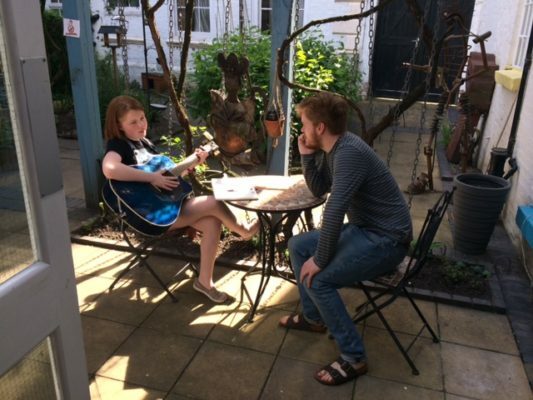 We hosted songwriting workshop for young people by folk musician and BBC Radio 2 Folk Award winner Greg Russell in spring 2018. During the five-hour workshop Greg shared song writing tips and advice and talk about how he approaches the process. It was followed by a short gig featuring the participants and with Greg performing some of his own songs. Dance artists: Sonia Sabri, Rachel Leggit and Poppy Mansfield. Schools: Chirbury Primary School, Gobowen Primary School and St George’s Junior and Radbrook Primary in Shrewsbury.